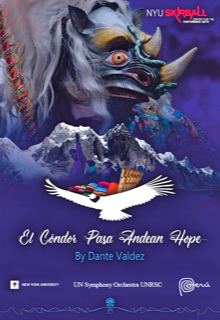 New musical "El Condor Pasa -- Andean Hope"
In the most ambition project to date, the orchestra is presenting an original new musical "El Condor Pasa -- Andean Hope" by the Peruvian composer Dante Valdez. The work is inspired by the indigenous legends of the Andean region and is infused with music and melodies of the Andes. The orchestra will be augmented with several ethnic indigenous instruments (quenas, zampoñas, charango), as well as soloists, dancers and chorus. Get your tickets at unorchestra.org/tickets.